The project involved the construction of a new build hotel. The facility comprises of a new 168 bedroom hotel & new Brewer Fayre restaurant. As part of ongoing development Premier Inn are aiming to develop 8 million sq. ft. of new hotel and restaurant space over the next four years to achieve their target of 85,000 bedrooms by 2020. All 168 bedrooms are the new Premiere Inn ‘new-generation’ rooms. The Hotel is located in the city centre of Bristol, in the popular area of Lewins mead, which is within walking distance from all the local amenities and attractions. 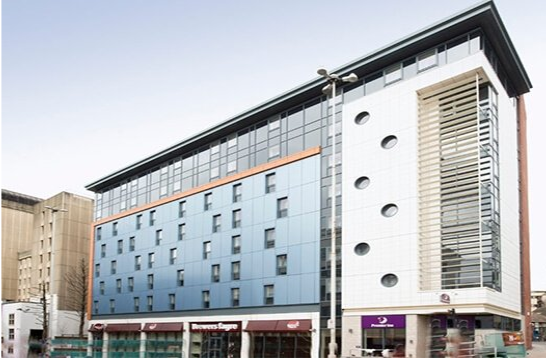 The new Premier Inn offers visitors the perfect base from which to explore all that the city and surrounding area has to offer . The completed project achieved a BREEAM ‘Very Good’ Rating. This was achieved with the help from the very efficient electrical & mechanical plant which included an air source heat pump hot water pre-heat and VRF air conditioning. Also LED lighting was installed throughout .